The value of a Air - 16 cents 1942 stamp depends on several factors such as quality and wear, supply and demand, rarity, finish and more. Values in the section are based on the market, trends, auctions and recognized books, publications and catalogs. This section also includes information on errors and varieties and characteristics. A Trans-Canada airplane in flight with an aerial view of what is believed to be Drummondville, Quebec. 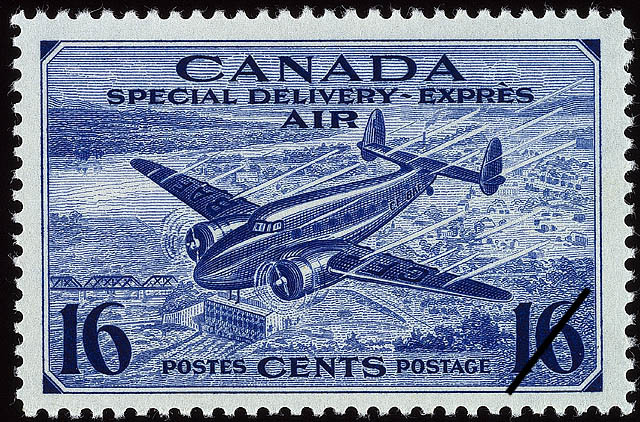 This stamp is an innovation combining airmail and special delivery service charges in one stamp. The design was chosen to emphasize the time saved in transporting by air, personnel and materials necessary for the speedy prosecution of the war effort.